I often feel pretty guilty that I don't post more on this blog. In theory, I'd love to be a blogger who updates 2-3x a week and has great content each time. But the reality is....life is busy. It's really busy. I think most people who've been reading a while already know this, but I have two kids and a full-time job, and I also try to be a relatively balanced human being who makes half-hearted attempts to clean her house a bit and workout once in a while (my love of food does nothing to help the fit of my clothing). And to top it all off, I'm generally a bit on the lazy side. So finding time to do all of the things that I'd like to do (in theory) is a challenge. R, my smallest mini-foodie, just turned two. She is a giggly little sweetheart who brings joy and smiles to everyone she sees. Of course, two weeks before said birthday, I realized I had done a whole lotta nothin' in terms of planning/inviting/etc. 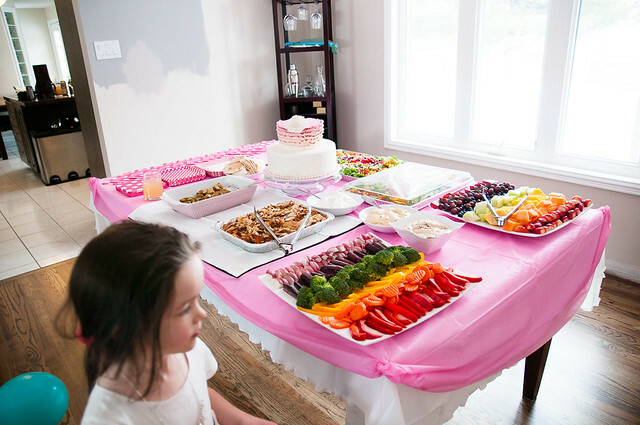 And I've set a bit of a precedent for myself in terms of having parties for my mini foodies. This pink decor (and yes, the white balance is terrible here. There is a cute little pink rose cake under that dome though, made by yours truly. Tutorial here.) First appearance of poms, backdrop and ruffled tablecloths. This pink, aqua and red decor (and yes, we got glorious new floors - reclaimed pine from Logs' End - and painted and all that fun stuff in the year between the pink photo and this photo....I seem to remember that we actually started ripping up the carpet the night after the party, and I spent a fun evening pulling staples). 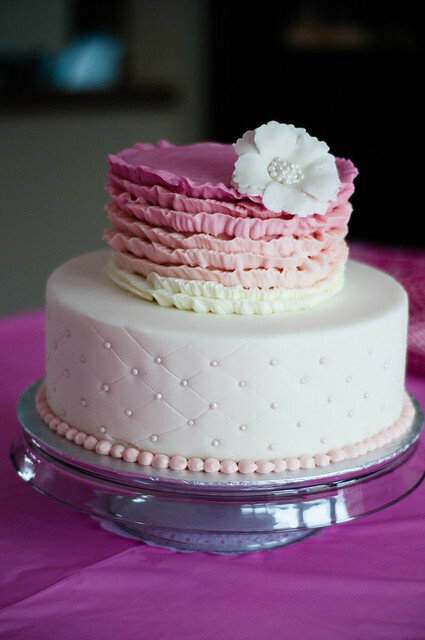 This was my first attempt at a two tier cake and I went with a ruffled cake, tutorial here. And so...yeah. Given the labour-filled precedent I had set for myself, I knew I had to do something for this delightful small person - something that would be cute and fun. And also try not to go insane. Oh, and we've moved, so our house is mid-reno, which always makes for fun times. Hubs has been working crazy hard to get everything done! I did what any logical person would do - I outsourced about 80% of the work, spent $10 on classy dollar store decor and sent out my invites via paperlesspost (I've used them for every kids party for the last five years and I LOVE them. So much cuter than typical e-invites and very cost-effective and easy to track your guest list). Before I talk about the food, I wanted to talk a little bit about a couple of things you can do with dollar store materials to dress them up. The first thing I make are these tissue paper pompoms. 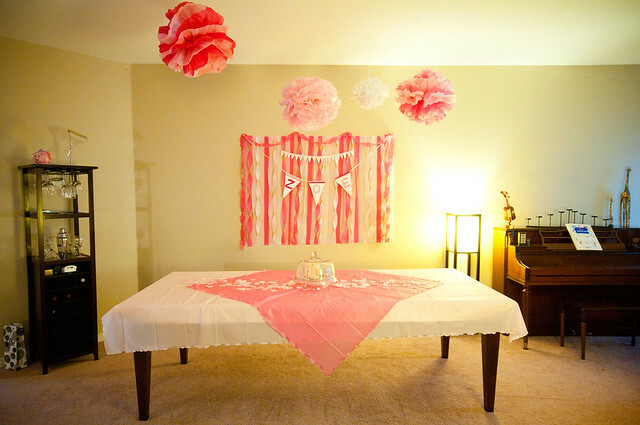 They are super easy to make, very inexpensive, and when you fluff them out, they really dress up a room. In the past, I've strung them on fishing line across my living/dining room, and this year (new house), I just covered up my ugly light fixture with them (for safety reasons, I elected not to turn on the light - nothing was touching the bulb, but I didn't want to take any chances!). Your local dollar store likely has tissue available in most colours - you need 8 sheets for a pompom - I made some ombre poms, which involved using different shades of pink and white, and I made some solid ones. I just tied mine using dental floss (in the name of full disclosure, I actually made these all at my desk at work during my lunch breaks, and then fluffed them out at home while watching terrible TV on Netflix - working mom multi-tasking FTW). 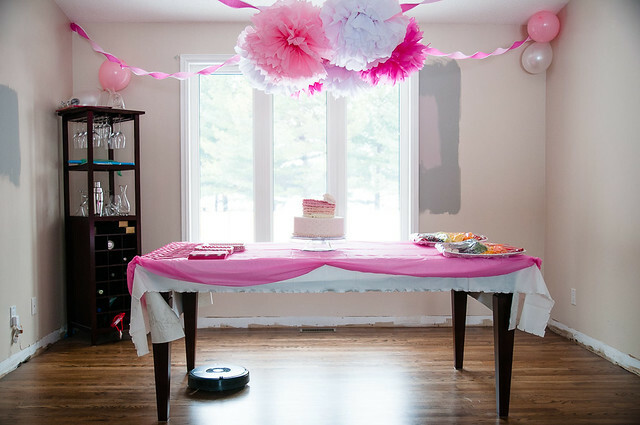 You can see Roomba doing his part in that photo too, hehe. I also find that cheap crepe paper streamers are another good way to make your room look more festive. I just twisted white/pink streamers in from the corners. The more streamers you have, the snazzier it will look, but I ran out of both time and energy, so I just did four. I think it was cute. 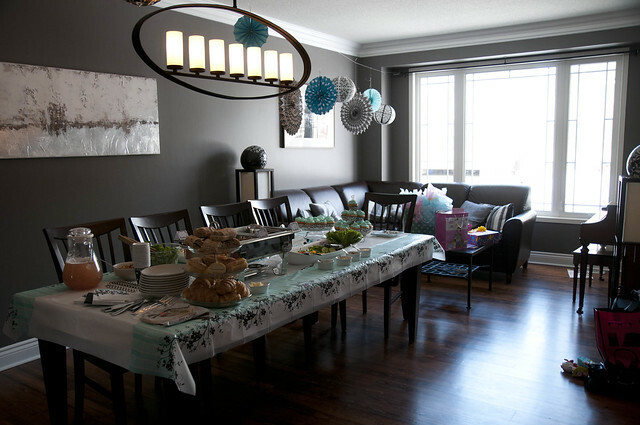 I also added some balloons in the corners, but you'll notice that one set fell down before the party started (oops). I'm pretty sure no one really noticed that much. One last little dollar store trick is the plastic tablecloths. Being the queen of all things lazy, I love these for parties. I can pick up one or two and have a cute, colour-coordinated table for $2, and then instead of washing, I can toss it at the end. Landfill gods, please forgive me. You can dress these bad boys up too. For the under cloth (the white one), I ruffled the edges, which is SUPER duper easy. You just keep your cloth folded in half (because it's half the work that way) and you gently pull along the edges, creating little ruffles. You have to be careful not to pull too hard because it will tear, but no one will notice a tear or two. For the top cloth (the pink one), I like to gather the edges - I've used safety pins in the past, but this time, I just used a needle and a bit of thread (dental floss will work too) and gathered it up at the corners. In retrospect, I can see it wasn't terribly centred, but I think it looked cute anyway. In terms of making a table look good, you can't go wrong with bright, fresh ingredients and white or glass platters. As I mentioned earlier in the post, this was very much a case of outsourcing - I bought family shawarma platters from my local shawarma place (SO GOOD! SO much delicious fresh food). I bought two and really should just have purchased one. A single platter is about $44 and comes with a lovely tray of fresh shawarma veggies (grated carrot, red cabbage, pickled turnip, pickles, hot peppers, salad, tabouleh, spiced onions), a tray of rice and chicken, a tray of garlic potatoes, and separate containers of both hummus and garlic sauce, as well as pitas. It's a great deal and easily feeds 8 people. I wouldn't call it health food because it's certainly high in sodium, but as an alternative to pizza or other takeout, I much prefer it because there's so much variety in taste and texture. And it's just delicious (did I mention that?). 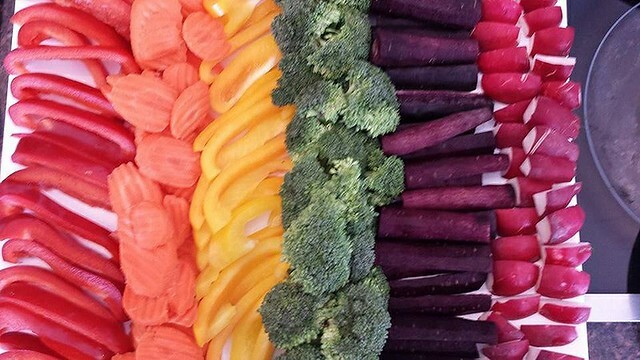 I also did two trays myself - a rainbow fruit tray and a rainbow veggie tray. This was pretty quick to put together, and I always like to make sure I have a nice variety of food at my parties, including lots of healthier options. Especially when there are kids. I certainly do NOT ascribe to the idea that all food has to be dumbed down to kid level. We had several young children at the party eating this food and they all LOVED it. I love these particular platters too - they are large white squares and I think they were about $15 when I got them. 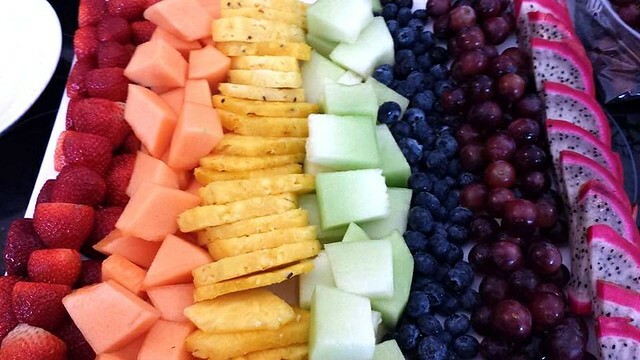 They are absolutely my most-used platters - you can't go wrong with white. Finally, the gorgeous cake (hint: I didn't make it). I met the baker through an Aqua BootCamp class and when she mentioned she was starting to make cakes, I took note and liked her page on Facebook (you can too!). 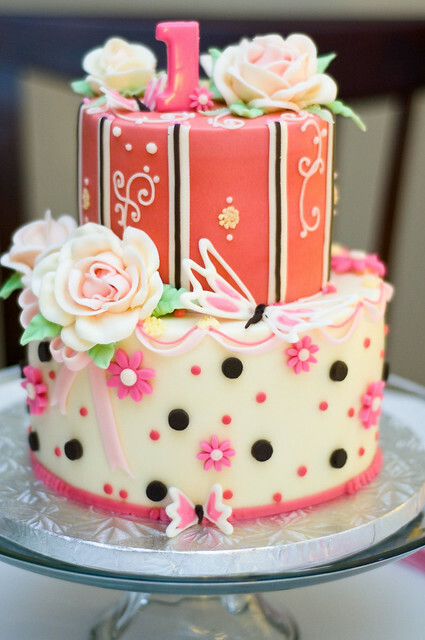 Her cakes are beautiful, and she was so wonderful to deal with - and you can see for yourself how sweet and pretty the end result is. What I also loved about ordering a cake was that instead of fussing last minute, making icing, re-making icing and then doing a messy, rushed result and having a virtual explosion of powdered sugar to clean up (ARGH), I could instead be more relaxed and spend time getting the house ready, chillin' with the mini-foodies and just generally being less stressed. You'll note in a few of the photos that my house is quite obviously in a state of renovation. That theme is likely to continue, but I do plan to post photos of some of the completed projects, as we finish them. 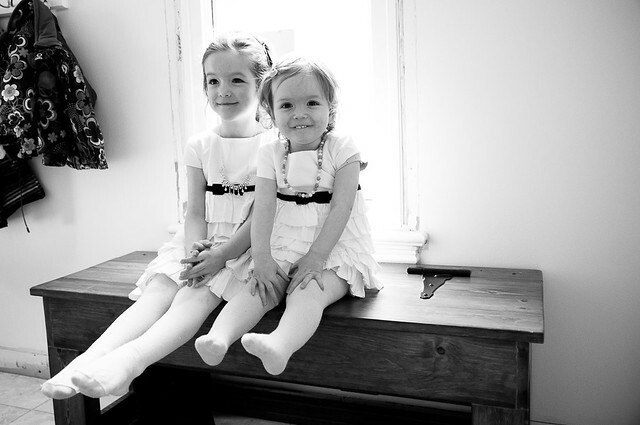 Last, just a quick pic of two of my favourite little people. Sometimes it can be exhausting trying to keep life on track, but the smiles and love from these two always help remind me of what's the most important part of these parties - fun times enjoyed and memories made with family and friends. Thanks for reading! 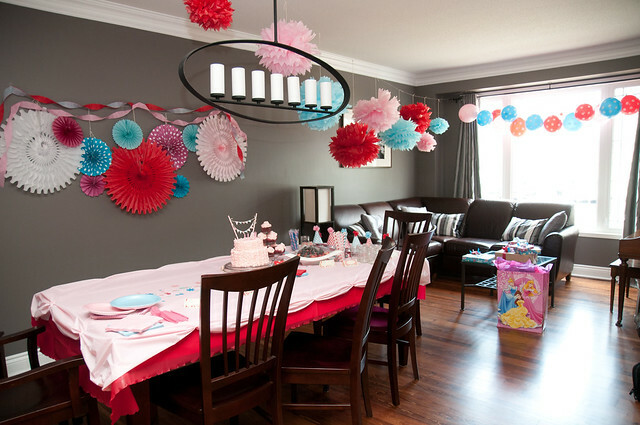 Would love to hear any of your tips for having a great party without driving yourself insane with the details! I had my little guy's first birthday party this weekend and I made those SAME pompoms (yours look better)! I'm feeling silly for not looking at the Dollar store for tissue - I ended spending way too much at Shoppers instead. Bah. I'll take notes for this time next year! Love your decorating and your girls sweet faces. Love this post! I should take a couple more pages from your menu to incorporate more greens and veggies in my diet for the boyfriend and I. Hope you'll continue posting so I can find inspiration meals. Those girls are very lucky to have a mom like you btw!